A 3-km trek through the lush green forests of Chaurangikhal takes one to Nachiketa Tal. It is an attractive spot amidst dense forests, and is situated between Panchangaon and Fold Gaon. Verdure all around and small temple at the band of the lake gives a serene picture postcard look to the beautiful surroundings. Rail :- Nearest Railway Stations Rishikesh. Air :- Nearest Airport is Jolly Grant. Still waters reflecting the snows from high above. The lakes of Garhwal and Kumaon ara a lyrical above. The lakes of Garhwal Kimaon are lurical experience. They are the sources of river. They are hight altitude delights where only the draing reach. They are the reasons why hillstations were created. They are reverd as goddesses they are celebrated with festivel . They insire you to Intospect . They invite you to ripple through their stillness perhaps on a paddle boat or may be with a parasll. The lakes they have a hundred reasons and move. Shyamala Tal is 132 km from Pithoragarh and 58 km from Champawat. Swami Vivekanand Ashram is located here at the bank of the lake. The blue lake of Shyamala Tal is spread over an area of about 1.5 sq. km. The area has some ruins dating back to the days of the early Chand rulers and others associated with the Pandavas. Delhi———————————- Shyamala Tal—————— 405 kms. Sukhidhang—————————- Shyamala Tal—————— 05 kms. The actual source of the Yamuna is licated at the very difficult-to-reach Saptrishi Kund. You must have a guide to go there. It is believed that seven great Rishis-Kasyapa, Atri, Bhadravaj, Visvamitra, Gautama, Jamadagni, and Vasistha-performed austerities for millions of years here. Saptrishi Kind is situated in the lap of the Bandarpunch Massif (6135m). The location of the Kund is amidst magnificent and enchanting surrounding of the lofty rock strewn glacier. The 8k-m trek to Saptrishi Kund starts from Yamunotri temple. The whole trek passes through dense forests and rugged mountainous terrain. It takes 16 hours to go up and back down. You have to deal with the high altitude, climbing up hills and over rock, ice, snow, and water. 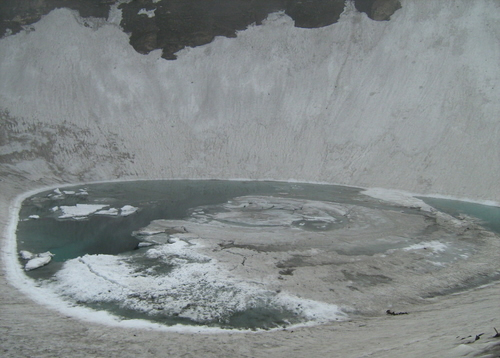 The Kund is avout a half km in diameter, and its water is dark blue with slushy snow. Very few people come here, as it is a difficult place to reach. Delhi———————————- Saptrishri kund—————- 442 kms. Jankichatti—————————– Saptrishi Kund—————- 05 kms. The Sahastra Tal and the Masar Tal lie to the west and east of the Khatling glacier, a lateral glacier at the source of river Bhilangana. The Valley of Bhilangana affords a panosramic view of snow-capped peaks and hanging glaciers such as Jogin group, Kirti Stambh and Meru, which are maginificent to say the least. The trek route passes through lush and verdant forests and green meadows, which during the monsoons come alive with flowers in full bloom. Trekkers have to also cross scores of small streams on improvised log-bridges. Delhi———————————- Masar Tal——————— 414 kms. Ghuttu——————————— Masar Tal——————— 45 kms. 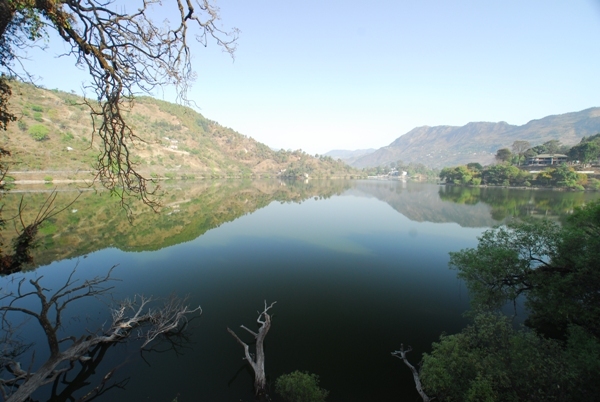 24 km from Nainital, it is the deepest and by far the most picturesque lake in the Kumaon region and derives its name from the nine comers which come together to form it. It is a tranquil, pleasant expanse of water, reflected green by the law, woodend hills cradling it and surrounded by 70 acres of predominantly oak forests which, after the monsoons, show the innumerable hues of the Himalayan forests. Situated at an altitude of 1,219m the lake is ideal fishing and watching migratory birds. Delhi———————————- Nauuchia Tal—————— 287 kms. Nainital——————————– Bhim Tal———————- 21 kms. Bhim Tal—————————— Naukuchia Tal—————– 04 kms. Rail :- Nearest Railhead Kathodadm. Air :- Nearest Airport panthnagar (Disst UddhamSingh Negar). 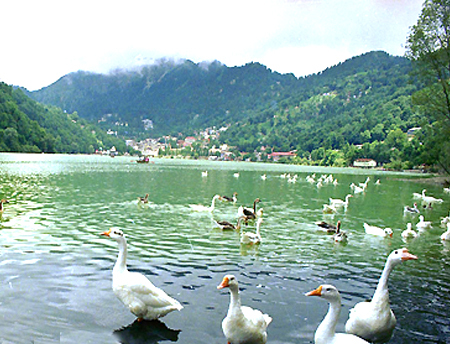 Located in the heart of hill station Nainital, Naini Lake offers boating facilities on its emerald waters. Boat Club provides strip-sailed yachts with professional yachtsmen to do the sailing. One can also enjoy horse riding on the tree-shaded bridle path around the lake. Legend it that while Lord Shiva was carrying the body of his consort Sati, who jumped into the sacrificial fire or havankund which was organised by her father Daksha Prajapati, her (Sati’s) eyes dropped out at this place and hence it came to known as Nainital.